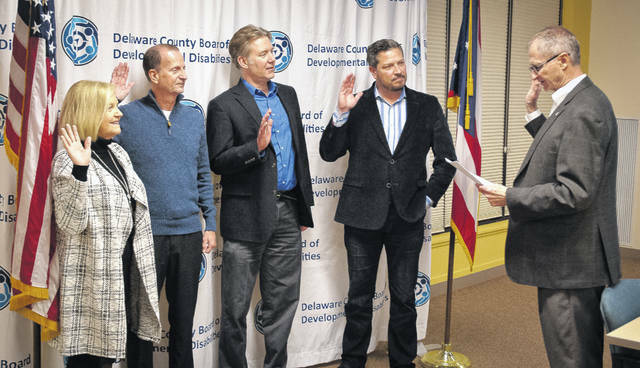 Newly appointed Delaware County Board of Developmental Disabilities members were sworn in Thursday evening (Jan. 17) by Delaware Commissioner Gary Merrell. The photo shows, from left to right, Dana Lehman, Stephen Finney, Theodore Klecker, and Louis Borowicz being sworn in by Merrell. Proud, excited and ready to serve, the newly appointed members of Delaware County Board of Developmental Disabilities (DCBDD) were sworn in Thursday evening (Jan. 17) by Delaware County Commissioner Gary Merrell. Before swearing in the appointees — Louis Borowicz, Theodore “Ted” Klecker, Stephen Finney and Dana Lehman — Merrell briefly expressed the commissioners’ appreciation to all the members of the board for their willingness to serve the residents of Delaware County. Borowicz and Lehman were appointed by Judge David Hejmanowski, Probate/Juvenile Division of the Delaware County Court of Common Pleas, while Finney and Klecker were appoint by the Delaware County Board of Commissioners. Borowicz, who was reappointed for another term, served as the DCBDD president last year, and he was elected as a trustee to the Ohio Association of County Boards of Developmental Disabilities, representing the North Central Region of Ohio. The region is comprised of Ashland, Crawford, Delaware, Erie, Huron, Marion, Morrow, Ottawa, Richland, Sandusky and Seneca counties. According to the Ohio Association of County Boards website, the board is a nonprofit entity providing critical support to the 88 Ohio county boards of developmental disabilities in the form of advocacy, legislative support, professional development training and communications. Borowicz said his involvement with developmental disabilities is a labor of love, because he is the father of a child with developmental disabilities. Borowicz is a partner of Baxter Borowicz Attorneys at Law, where he is focused on counseling families and people with developmental disabilities in trust planning, and transitioning children into adulthood with special needs by meeting their legal and benefits needs. Finney, a former member of the board, served for 12 years prior before taking a break from the board. Like many on the board, Finney has a personal connection through his daughter, 32, who is disabled, still lives at home, and receives services from the board. Finney said he retired after 39 years of employment spread out between the U.S. Army, U.S. Air Force Navigation Systems, and the Department of Defense, where he served as product test lab chief for the Defense Logistics Agency. Finney said he lives in Westerville, where he does a lot of things in the community focused around what he calls “the differently-abled peopled.” He also volunteers for Meals on Wheels. “When I first came to the board, we served about 1,500 individuals. Now we’re up around 2,300-2,400 people, and it’s still growing,” Finney said. Lehman said she grew up in Dayton and lived in the Galion area where she raised her two daughters. She said once her daughters married and moved away from home, she decided 10 years ago to migrate to Delaware County to be closer to her grandchildren. “I’m excited to be a part of the community, and I’m very impressed with what our county has been able to deliver here,” she said. Prior to retirement, Lehman said she served as a nurse for 30 years in the medical field with lots of opportunities to care for patients of all types. Lehman said this is her first time on the board, but she has served on the Morrow/Delaware County Mental Health Board and is active in her church and outreach programs. Klecker moved to Powell in 2010 with his family. He is an attorney currently serving as senior legal counsel for the Central Ohio Transit Authority and has provided legal counsel for Opportunities for Ohioans with Disabilities. Klecker said he has a 17-year-old son with disabilities that receive services from the board. He said he is a junior this year at Olentangy Liberty High School. Klecker said his exceptions, for now, are that he is proud of what DCBDD is doing, and he thinks it’s important to keep an open ear to see where the board is going.